Fort Zachary Taylor Historic State Park, annual home to Fort Taylor Civil War Heritage Days, is the nation’s southernmost Civil War era fortress. As such, it was part of the Third Tier System of Defense Fortifications plan. The fort is named for President Zachary Taylor, and construction began in 1845. In 1861, as Florida prepared to leave the Union, Federal artillery troops of Co. B, First U.S. Artillery secured Fort Taylor. The fort remained in Federal hands throughout the entire conflict. Its main role was to serve as headquarters of the U.S. Navy’s East Gulf Coast Blockading Squadron. In 1898, Army engineers removed the top two tiers of the three-story fortress and constructed two Endicott-period coast artillery batteries over the Civil War-era casemates. The fort remained on active duty until 1947 when it was surplused to the U.S. Navy. Fort Taylor was named as a National Historic Landmark in 1973. The property was donated to the state of Florida in 1976 and opened to the public in 1985. The fort holds the largest cache of Civil War-era seacoast cannon in the U.S. Nearly 200 Rodman, Columbiad and Parrott cannon were used in the construction of Endicott batteries as in-fill. The cannon remain buried within the Endicott battery walls. Prior to the start of the Civil War, Capt. John Brannan occupied the fortress, placing it in Union hands. The main role of Fort Taylor during the Civil War was to serve as headquarters for the U.S. Navy’s East Gulf Coast blockade squadron. This squadron deterred numerous supply ships from reaching and leaving Confederate ports in the Gulf of Mexico. While Fort Taylor never saw any hostile action, many historians have argued that because of Fort Taylor and its mission, the War of Rebellion was not allowed to continue any longer than it did. The 10-inch Rodman and Columbiad cannons at the fort had a range of three miles. This was an impressive deterrent to the Confederate navy, preventing them from attempting to take the fortress or the island of Key West. Proving to be a severe loss for the South, Fort Taylor remained in Union hands throughout the Civil War. By the time the three-story fort was finally finished in 1866 (21 years after it was begun), there were many impressive features included. Items such as sanitary facilities flushed by the tide and a desalination plant, which produced drinking water from the sea, were available as early as 1861. 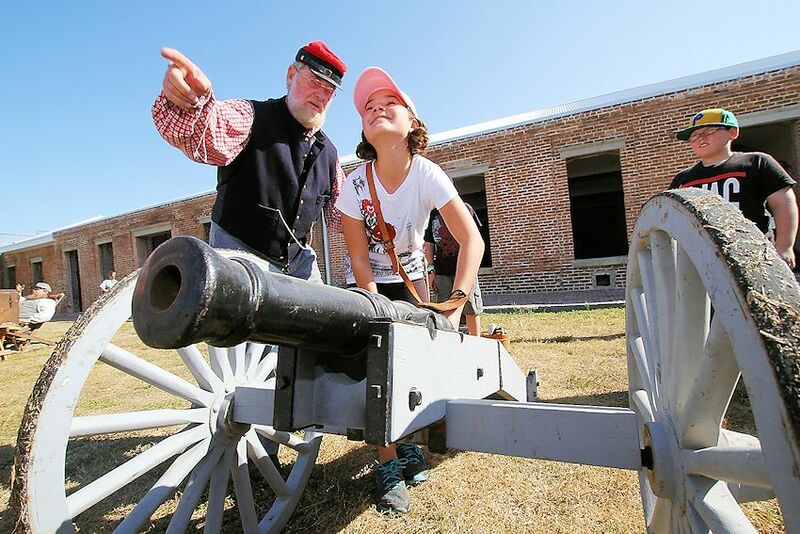 A total of 140 guns and a large supply of ammunition were on hand to secure the fort. In the years that followed. Fort Taylor was again used during the Spanish-American War. In 1889, in an effort to modernize the fortress, the top levels were cut down to install newer weapons. Further remodeling also included the addition of Battery Osceola and Battery Adair on the inside of the fortress. With the coming of the 20th century, more sophisticated weapons and eventually radar and other devices took the place of guns. By 1947, the Army turned Fort Taylor over to the Navy to maintain. Beginning in 1968, through the tireless efforts of volunteers, excavations for old armaments in the gun rooms uncovered a number of guns and ammunition from Civil War times. This represents only a fraction of the buried arsenal, which is the largest collection of Civil War cannons in the U.S. In recognition of this, Fort Taylor was placed on the National Register of Historic Places in 1971. Two years later, the fortress was designated a National Historic Landmark.